Monteverde was first inhabited in the 1930's by Costa Ricans colonist who were trying to make a living by logging and farming, claiming undeveloped land quite similar the early U.S.A.'s Far West times without any help from Costa Rica's government. In 1949, 4 pacifist Quakers from Alabama were jailed for refusing the Korean War draft. After getting out of jail along with their community of Friend's (the other name for their Christian religious group) they searched for a country where they could live in peace. Costa Rica attracted them because it does not have an army and the area was interesting because it was so green, underdeveloped & the cool climate was perfect for dairy farming. In 1951, 44 Quaker settlers from 11 families came to the area and coined the name (meaning green mountain in Spanish). They brought with them their sense of friendship & cooperation. The seeds of these community organizations. Monteverde Cloud Forest Preserve - Pioneers of environmental tourism, the Reserve quickly gained world-renown respect for it's extraordinarily rich cloud forest. After 30 years, it continues to serve as an inspirational model of conservation. 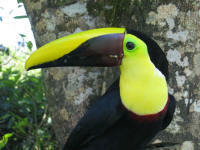 Tropical Science Center - the not for profit organization managing the Monteverde Preserve. Friends of Monteverde Cloud Forest Preserve - a U.S. based non-profit organization dedicated to preserve the biodiversity of the Cloud Forest Preserve & support the Tropical Science Center. Santa Elena Cloud Forest Reserve - Located high on the Caribbean slopes of the Cordillera de Tilarán, the Santa Elena Cloud Forest Reserve is one of the first community managed reserves in the country. With the help of Youth Challenge International, a Canadian Non-profit Organization, the Costa Rican government and the Santa Elena Community. 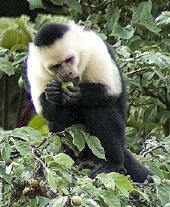 Monteverde Conservation League - established in 1986 out of concern for the threatened forest in the Tilaran Mountains. Since then, children and adults from over 40 countries have raised money which has enabled the League to purchase more than 54,000 acres of land, the biggest private reserve in Costa Rica. It is named Bosque Eterno de los Ninos in honor of all the children who have contributed to its protection. Mission: to conserve, preserve and rehabilitate tropical ecosystems and their biodiversity. Monteverde Institute - a non-profit educational association by residents, the MVI blends international study and research with educational and cultural opportunities for local Monteverde communities. Organizers of the annual Monteverde Music Festival. The MVI also sponsors and supports research that can be applied to local, national and international issues of environmental degradation and the decline of biodiversity, rapid social and demographic change, and community health. Monteverde Costa Rica Cloud Forest research data base Over 125 ecologists, agriculturists, and educators have contributed to the natural history and ecology of the area. Our objectives are to bring together the extensive body of knowledge that researchers and natural historians have gathered; to point up connections, to identify areas for future research. Extensive bibliography related to the area. Monteverde Cheese: the cooperative was sold to Sigma Alimentos in 2013.
http://www.cloudforestschool.org Creative Learning Center. Elementary non-profit bilingual (Spanish and English) school. Monteverde Natural History - Plants & butterflies of the area: Identification and Other Resources by William A. Haber. Monteverde Coffee Cooperative Tasty! (in Spanish) Fair-trade & biologically produced high quality Cloud Forest coffee respecting the environment by the Cooperative of Monteverde. Montana Coffee Traders - if you live in USA and would like to buy online fair-trade coffee. Texas Coffee Traders - if you live in USA and would like to buy online fair-trade coffee. A walk through the Monteverde cloud forest reveals a lush green garden of mosses, ferns, flowers and epiphytes growing thickly on every tree. Clouds drift in and settle among the slopes, giving the continuous moisture required for such exuberant plant growth. Dangling roots and vines sweep across the trails. The air is rich with the sounds of birds and the occasional scurrying of small mammals on the forest floor is always magic. Monteverde is a highland forest characterized by nearly 100% humidity throughout the year. Here in the Reserve, warm North-Easterly trade winds, filled with moisture, blow in over the Atlantic. As the winds sweep up to the Continental divide, they cool and condense to form clouds, bathing the forest in a constant soft mist. The cloud forest receives our meters of rain every year- that is almost twelve feet. One of the cloud forest characteristic is the abundance of vegetation. Competition for growing space is so intense that trunks and branches are almost entirely covered epiphytes, lichens, liverworts, bryophytes and mosses. The epiphyte mats store moisture, which is specially important in the dry season (February to May). The lush cloud forest canopy is thus home to many species of insects, amphibians, and mammals which never even come down to the rainforest forest floor. is a highland forest characterized by nearly 100% humidity throughout the year.